Unfortunately there will be no stories tonight…I am afraid that anything I say will be misunderstood. Instead of waiting until I am in a better place, I am doing something different – I am leaving you with a recipe. That’s really what this blog is about anyway. I am a little different from most – I do not eat when I am upset – I react in the opposite way. Some people would say that is a blessing. Combine first 3 ingredients in a large bowl; beat with a mixer at medium speed until light and fluffy. Add eggs, beating until incorporated. Stir in 1/2 teaspoon vanilla. Weigh or lightly spoon flours into dry measuring cups; level. Combine flours, powder, soda, and 1/4 teaspoon salt. Combine sour cream and 1/4 cup milk. Add flour mixture and sour cream mixture alternately to butter mixture, beginning and ending with flour mixture. Combine 1 teaspoon canola oil and chopped bittersweet chocolate in a microwave-safe dish. Microwave at HIGH for 1 minute, stirring every 20 seconds until smooth. Stir in 2 tablespoons cocoa. Remove 2 1/2 cups vanilla batter; add to chocolate mixture, and stir. 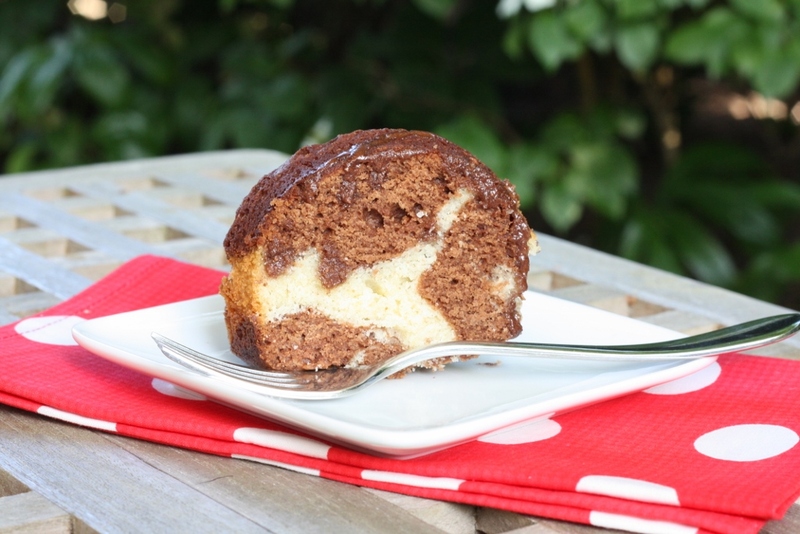 Using 2 ice-cream scoops or 2 large spoons, add batters alternately to a 10-cup Bundt pan coated with baking spray; swirl. Bake at 350° for 50 minutes or until a wooden pick inserted in center comes out clean. Cool in pan 15 minutes. Remove from pan; cool on wire rack. You always make the most delicious desserts every week.